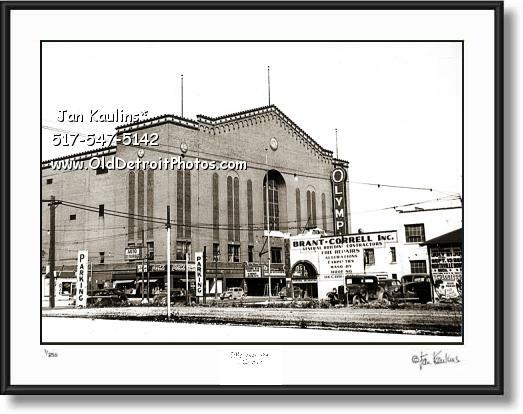 DETROIT OLYMPIA STADIUM 1947 photo picture print photograph for sale. This is a unique DETROIT OLYMPIA STADIUM photo print from 1947. It shows vintage vehicles parked on Grand River as well as in the parking lot across the street. This rare image was made from the only existing small 3x5 original 1947 Olympia Stadium Detroit photo. The quality is good for an image from such a small original photograph. There is a sign on the side of the building across the street for Brent-Correll Inc. General Building Contractors. This photo has never been previously published anywhere. It came from a private collection. It would look very nice in a print up to 11x14 in size. After that it might be a bit fuzzy, considering the small size of the original photo.